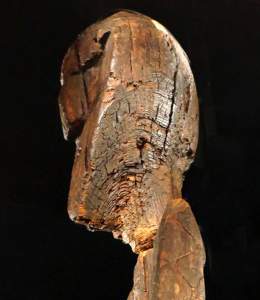 The Shigir Idol, a Totem Pole type figure, has recently been dated by German archaeologists in Mannheim as 11,000 years old. Accelerated Mass Spectrometry was used on seven miniscule wooden fragments. 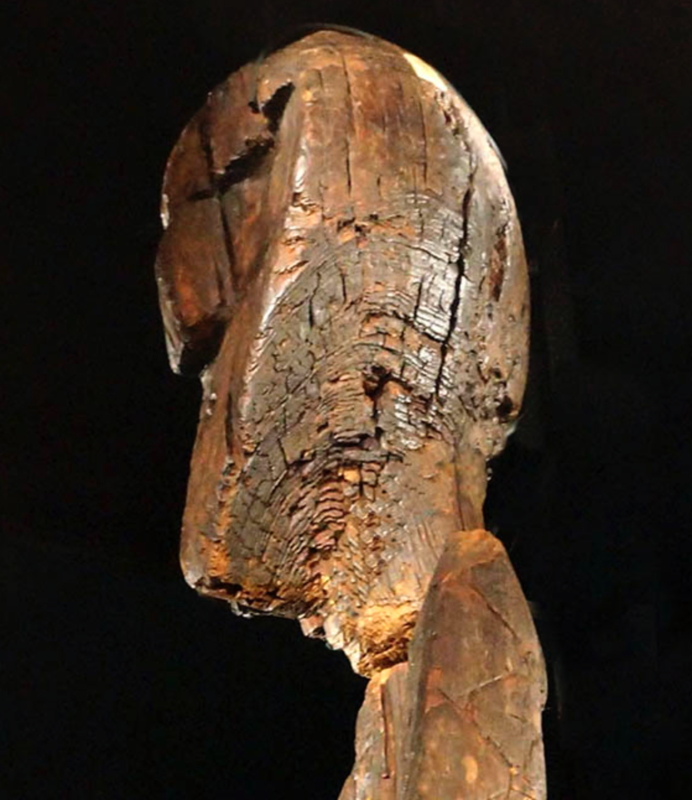 The head of the Shigir Idol seen in profile, strange and yet oddly familiar. 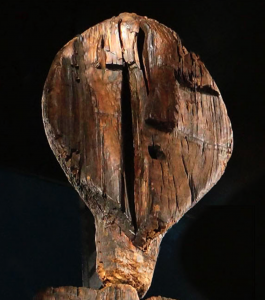 This dating puts the Idol as 1,500 years older than had been established by tests conducted in Russia in 1997 by G. I. Zajtseva at the Institute of the History of Material Culture. 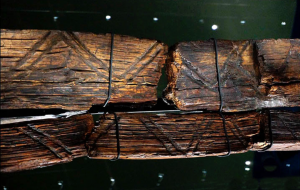 It also confirmed the wooden sculpture as the oldest wooden monument in the world, twice the age of the pyramids and 6,000 years older than Stonehenge. It is around the same date as anthropomorphic stone stelae found in Gobeke Tepe in modern-day Turkey. The Shigir Monument, as it stands today at 2.8m tall, was originally an estimated 5.3m tall. The head of the Idol front on. The original dating was widely questioned in the West and it is a considerable relief to the Russians that the German tests have reflected the Russian dating. The Idol is carved from larch using wooden tools. At the top there is head with a mouth, nose and eyes. The main body of the pole has geometric and criss-cross chevron carvings and more heads at various intervals. 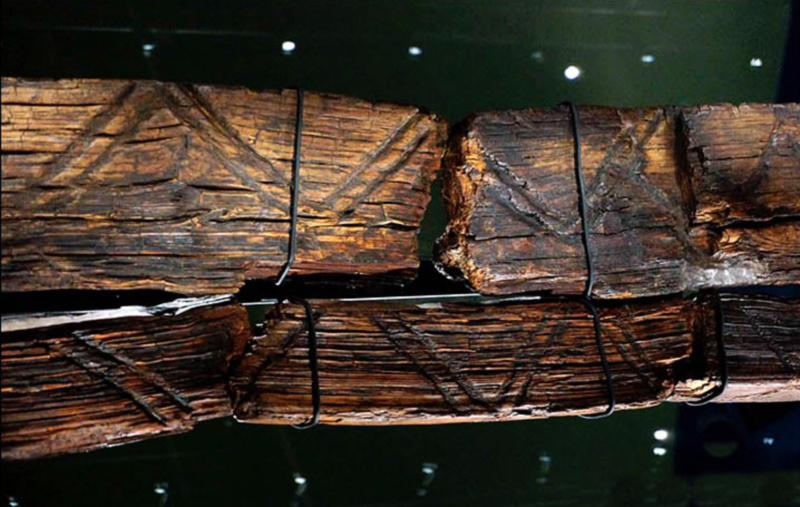 A Sverdlovsk museum official said, “This confirms that hunters and fisherman from the Urals created works of art as developed and as monumental as ancient farmers in the Middle East.” The recent re-dating has sparked up discussion as to what the pole and its hieroglyphics mean. Some maintain it contains information on the creation of the world from ancient man whereas other believe it is an ancestor figure designed to watch over those living, much is found in other primitive societies such as in Papua New Guinea where similar idols are found. The Idol also contains remarkable similarities to Totem Poles constructed by Eskimos and North American Indians. And of course, some are convinced that it depicts visitors from outer space. While the messages remain “an utter mystery to modern man,” it was clear that its creators, “lived in total harmony with the world, had advanced intellectual development, and a complicated spiritual world,” he said. 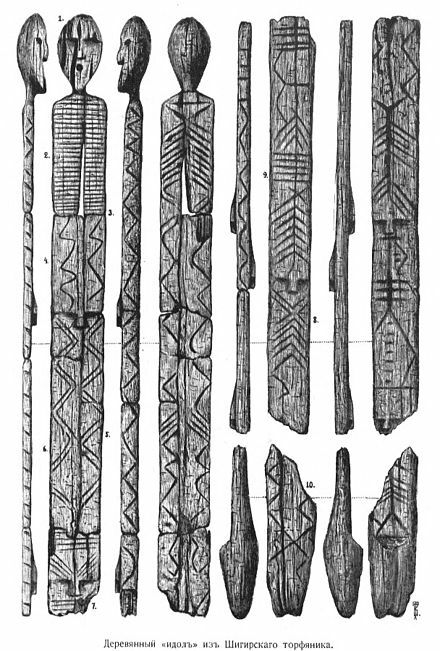 The Shigir Idol in all profiles showing the geometric designs and at least five different faces. 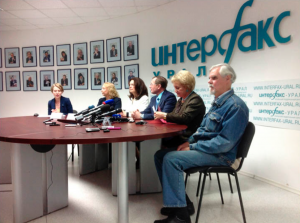 A result of this controversy is that The German scientists who conducted the research have been avoiding the recent press conferences in Russia. 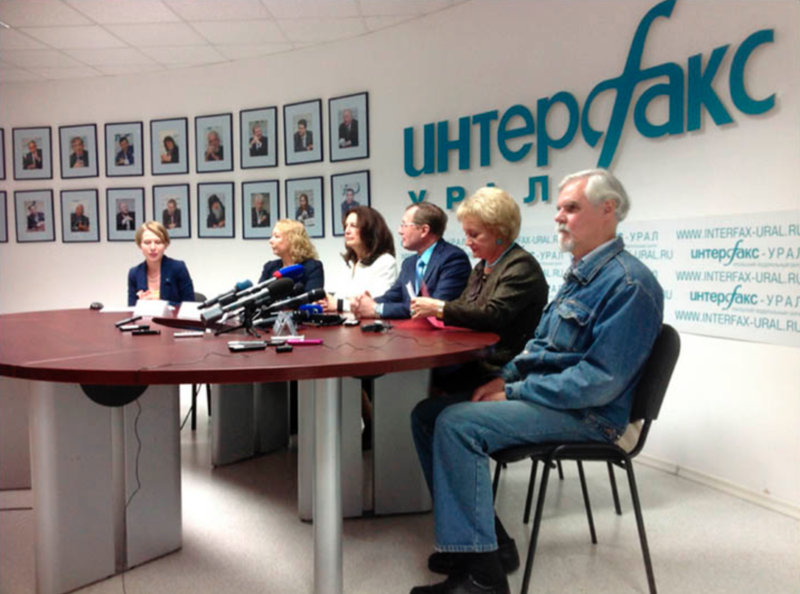 A press conference of the joint research held in Yekaterinberg on August 27th, 2015. Amist all the speculation and legal problems what is certain is that this magnificent sculpture is hieratic, mysterious, puzzling and beautiful and it opens a window onto our collective past. 99.9% of current art world comment is in a lather of excitement over the success of the contemporary art markets in London over the Frieze Art Fair week. Paintings by Peter Doig, Alberto Burri and Lucio Fontana contributed to a an US$120m total at Christie’s alone. Amidst all this tiresome froth and noise it is refreshing to contemplate an artwork from our ancient forebears and to wonder who they were, how they lived and what they were trying to achieve, or perhaps even tell us, by creating this magnificent Shigir Idol.